The made-to-order trellises have arrived and I’m tickled with their style and quality, as well as the cottage appeal they lend to the house. It took me a long time to decide what type of structure would look best, but when I discovered Jim Warren of Ornamental Steel Designs at the Greenville Gardening Symposium earlier this year, I knew I had found the right person to guide me through the process. I gave Jim a handful of photos I had taken, or found on the internet, and we played with several ideas before I made a selection. The final design is an updated version of a trellis on the historic Seibels House in Columbia, South Carolina, where many weddings are held. 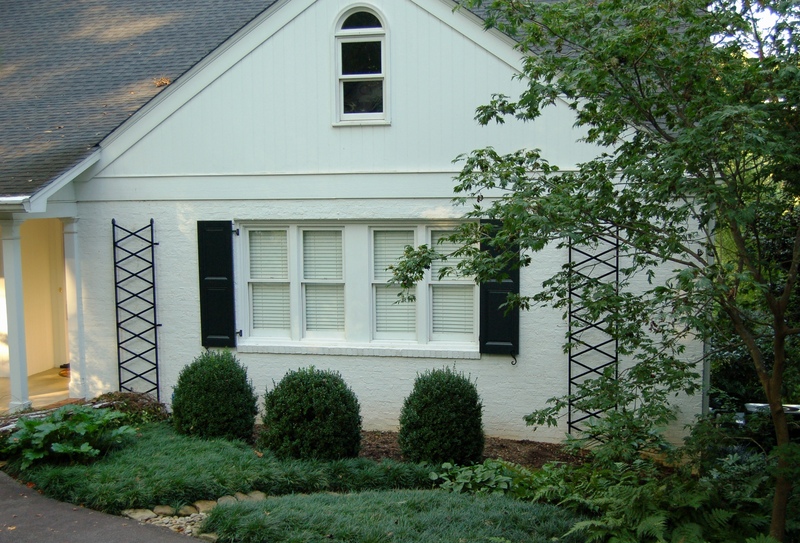 The first trellis to go up replaces a plastic model that provided support to a Confederate jasmine. I love the bold and graphic simplicity of the final product. 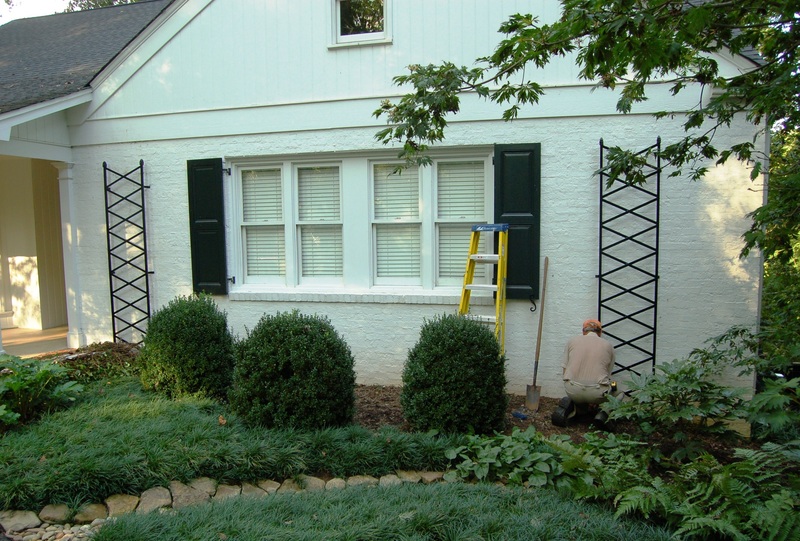 Jim’s superior workmanship is evident even from a distance and the custom trellises do the house proud. Careful measuring and installation ensured a perfect fit. The last screw goes in place! There’s only one thing left to consider…and that’s to make a decision about the Confederate jasmine (Trachelospermum jasminoides) which covered the previous trellis. The choices are either to cut it back within a few inches of the ground and encourage it to regrow, or to thin the vines and weave them into the new trellis. You can contact Jim at ornamental.steel@gmail.com. 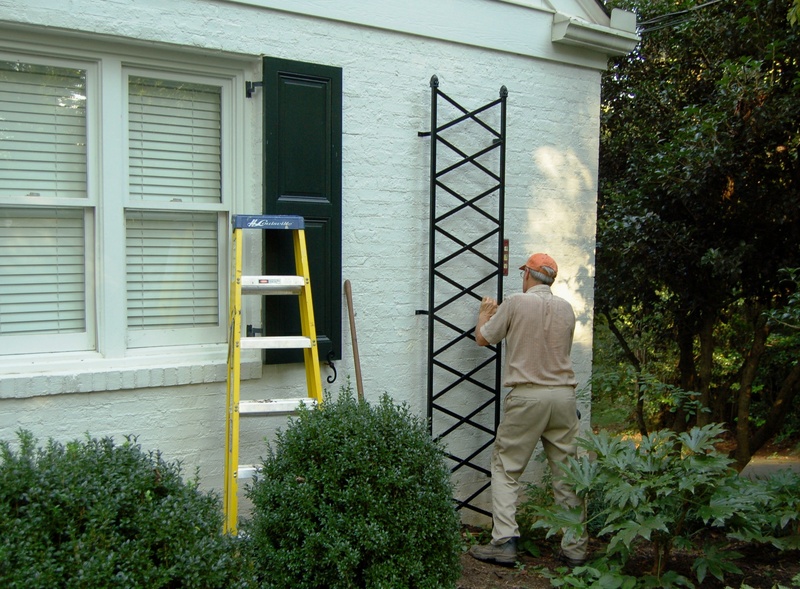 This entry was posted in Gardening, Uncategorized and tagged Confederate jasmine, custom made trellis, Ornamental Steel Designs, Trachelospermum jasminoides, trellis, trellises on September 5, 2013 by Marian St.Clair. Weave thinned stems. Otherwise they’ll be so weak and it is late in the season for them to harden. Why not thin weave and see how they look now? They will look good over the winter too. They look so good and so smart but won’t they be hidden by the jasmine all year if it is allowed to grow up them. How about a viticella clematis which has to be cut down in the winter, then you can admire your trellis during the winter months? Pauline–As you suggest, I’m very tempted to do away with the jasmine. I love looking at the bold form of the trellises. I just finished weaving some confed. jasmine through my trellises this morning! I agree with the thin weave – apart from assuring blooms next spring the trellises will look more beautiful with vines on them. 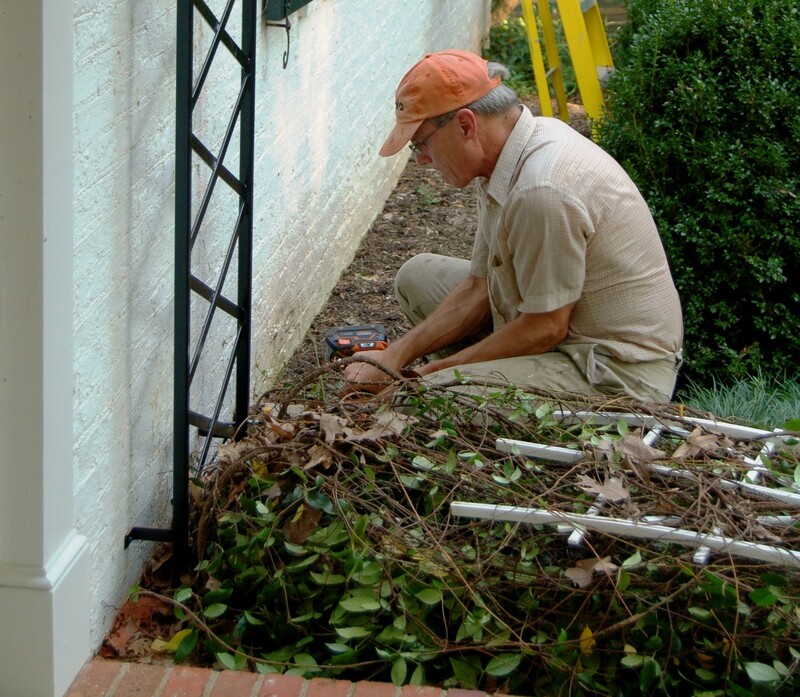 Keep your clippers handy or the jasmine will hide the trellises in no time. I like the idea of thinning the existing CJ and weaving it up the trellis (which, BTW, are lovely). Another thought would be to do annual vines that come down during winter. That would allow you to have a different look each year, if you so desired. Isn’t it fun to have this decision to make? Lovely trellises. I vote for the instant gratification of the thin-and-weave option. 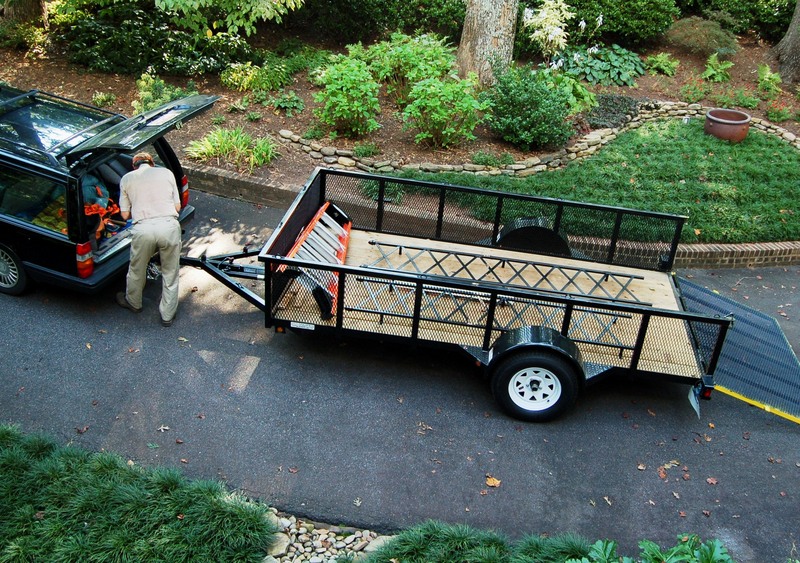 The Confederate jasmine will drive you crazy spewing out of the top of your trellises. I’ve go the same arrangement on either side of my back bedroom window and am having to prune it weekly it seems. Of course, you probably know this already, since you had it trellised previously. I’m thinking of replacing mine with a less aggressive vine. A garden writer and nature advocate, Marian explores both cultivated landscapes and places of natural beauty with equal enthusiasm.